Historical volatility: This is the actual price fluctuation as observed over a period of time. Option premiums will rise and fall with volatility. These pricing models make the incorrect assumption that volatility is constant throughout each respective strike price and regardless of duration. Supply and demand will never allow these conditions to exist. It is, however, possible to calculate IV for different strike prices and over different time frames by using the current options price as a given, using the other five inputs listed above and then solving for that specific IV. The difference in implied volatility levels for options with the same underlying security is known as volatility skew. Stated differently, it is the difference in IV between out-of-the-money, at-the-money and in-the-money options and also different expiration periods. In these instances the I-T-M and O-T-M strikes have higher IVs (more expensive) than the A-T-M strikes. By studying the IV chart patterns we know that the volatility assumptions made by option pricing models rarely exist in the real world. IVs ARE different across different strikes and time frames. Generally the market assigns a higher IV for lower strikes and higher IVs for longer durations for the same strikes. These typical stock IV patterns result in skew patterns. When a skew develops into a smile there is an expectation of greater price movement in the future causing the chart pattern to turn up into a smirk or smile. Some sophisticated options traders will trade with or against the skew. That discussion is beyond the scope of this site. For our community of Blue Collar Investors we use our knowledge of skew and smile patterns to better understand the relationship between IV and our option premiums and to red flag potential risk in the future. For the week, the S&P 500 rose 0.3% for a year-to-date return of 16%, including dividends. BCI: Neutral, favoring in-the-money strikes. This may be a month to keep some cash on the sidelines, favor ETFs or low-beta stocks and in-the-money strikes. This site believes the negative tone is short-term. I had an offsite question as to whether The Ellman Calculator can be used for weeeklys. The answer is yes because the calculation is annualized based on the expiration date. In the screenshot below (single tab) we show the calculations for two weeklys for QQQ. The 1-week and annualized returns are highlighted in yellow. CLICK ON IMAGE TO ENLARGE AND USE THE BACK ARROW TO RETURN TO BLOG. The Weekly Report for 10-19-12 has been uploaded to the Premium Member website and is available for download. One of the stocks on the Premium Report this week, V, has Weekly Options for those of you who have a higher risk tolerance. However, please remember that because of the short duration of these options, you will not be able to effectively use Alan’s Exit Strategies. Great introduction on IV and Skew. 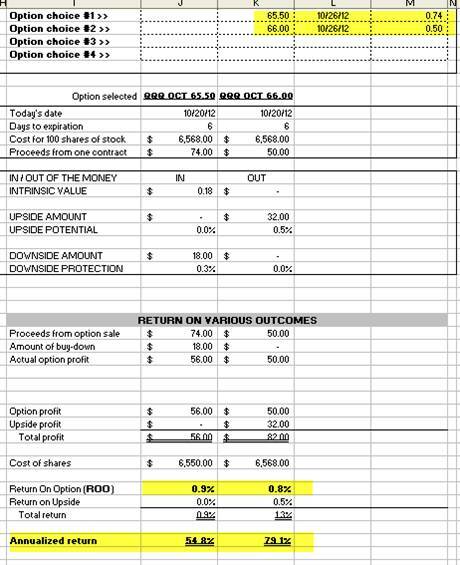 I understand that the BCI methodology mitigates alot of risk inherent in options trading. Based on the article above regarding Skew do we need to incorporate any type of process outside the BCI methodology that would include us now checking the skew on any possible covered call positions before actually selling a contract? 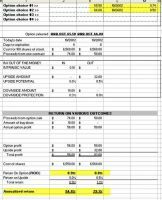 We are already checking for earnings reports, would this additional step benefit us? Glad you like the article. You DO NOT need to take any additional steps outside of the methodology described in my books and DVDs. You are 100% spot on when you say that the system mitigates much (but not all) of the inherent risk in trading options. I have been writing weekly articles for five years now and the ideas come from my team and I partially but mainly from you, our members. This site is here for us to learn from each other and the more educated we are, the closer we are to becoming “CEO of our own money” and ultimately financially independent. 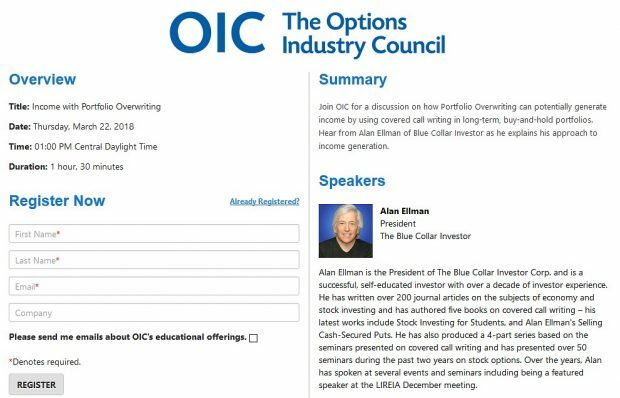 Understanding why the IV of options on the same stock can vary from strike to strike and expiration to expiration is important but does not require us to take any additional steps in the BCI methodology for cc writing. Can you explain the difference between a married put and a protective put. Thank you. A married put is exactly the same as a protective put except for the time when the underlying security was purchased. A married put and the stock are purchased at the same time. THank you for the work and education that is ongoing! You have some basic rules to follow, depending on our risk etc. Yet many times you have on your premium list options with a large spread over (1-2 or more $$$ over) the .30 suggested spread. Why are they on the premium list. THere are also several stocks tht do not have the suggested 250,000 volume that your rules recommend. Wondering why these are continuously on the premium list. As for your volume question…we screen for average volume over the past 50 trading days to be >250,000 shares per day. This is to insure that there is decent liquidity. I went back and checked all of the stocks that passed this week and were on the Running List, and every stock had an average volume greater than 250,000 shares per day. It is possible that on a given day, the volume may be lower than 250,000 shares per day. The average volume per day is actually the very first item that gets screened each week. I hope that this answered your questions…if not, please post and I’ll get your questions answered. Interesting twist on Linda’s question! Actually, these are two different issues. Linda’s question had to do the volume of the underlying (stock). Your question has to do with the option volume and option liquidity. We do not screen for Open Interest (OI). This is because it has to do with the subscriber’s selection of the option (DITM, ITM, ATM, OTM, DOTM)…which has to do with the subscriber’s opinion of the market, as well as their risk tolerance. Due to the potential impact of hurricane Sandy, the Premium Report may be late this week. Since both Alan and I live in the direct path of the storm, there is an outside chance that we may have power outages. As a precaution, we wanted to make sure that we gave you a heads up.